Not only the young and beautiful wanted an enviable shape! 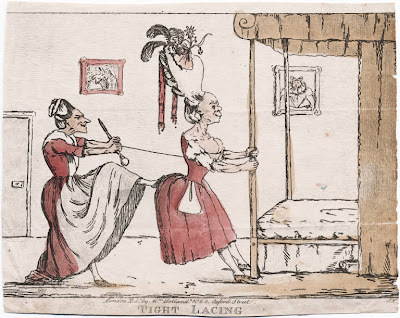 This satire is going after the familiar subject of mutton trying to be lamb as the old woman is employing tight lacing to meet the current fashion and compete in style with the young. Her enormous headdress, bulging breasts, scrawny neck and narrow waist get the point across rather quickly. This is a variation on the "Tight Lacing or Fashion Before Ease" print, hitting two female foibles at the same time. a twofer.